Hair loss during menopause is very common, and many women suffer from hair loss caused by estrogen deficiency. Even so, hair loss due to estrogen deficiency can be extremely upsetting, and can leave women with self-esteem issues. Hair is a big part of a person's identity, however, women do not have to endure hair loss caused by estrogen deficiency; there are steps that can be taken to treat it. How Does Estrogen Deficiency Cause Hair Loss? When women enter menopause, they experience an imbalance in their estrogen and progesterone hormone levels. A decrease in estrogen hormones causes women to suffer from hair thinning and hair loss. With a lack of estrogen, hair follicles become fragile and hair growth becomes much slower, leaving women with hair loss caused by estrogen deficiency. What Can Be Done to Stop Hair Thinning? Taking regular exercise can help to boost a woman's estrogen hormone levels and prevent hair loss and thinning. A healthy body is more able to balance its hormone levels than an unhealthy one. Eating a diet rich in fruits and vegetables is vitally important; however, foods that are rich in protein (such as red meat and eggs) and iron (such as leafy greens) are especially good at prompting hair growth. Natural supplements (such as Macafem) have also been shown to encourage the production of estrogen levels and slow down the rate of hair thinning and hair loss. Extreme hair loss caused by estrogen deficiency can be treated with certain prescribed medications, like lotions that can stop or slow down hair loss and hair thinning. They are available through a doctor's prescription. 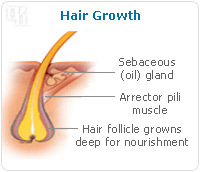 However, all of these treatments are more focused on the slowing down of hair loss caused by estrogen deficiency rather than on encouraging new hair growth. There are different management methods that women can make their hair look thicker and more voluminous. Choose a flattering haircut, but stay away from layers, as these can cause hair to look flat and limp. Use a volume boosting shampoo and conditioner to make hair look thicker. Avoid using hair styling tools, such as straightening irons, and stiff hairsprays that can cause hair to become brittle and break. Although hair loss during menopause is common, it can still be upsetting. However, with the available treatments for hair loss caused by estrogen deficiency, women do not have to endure this symptom. Click here for more information about increasing estrogen levels, and treating unpleasant menopause symptoms like hair loss.